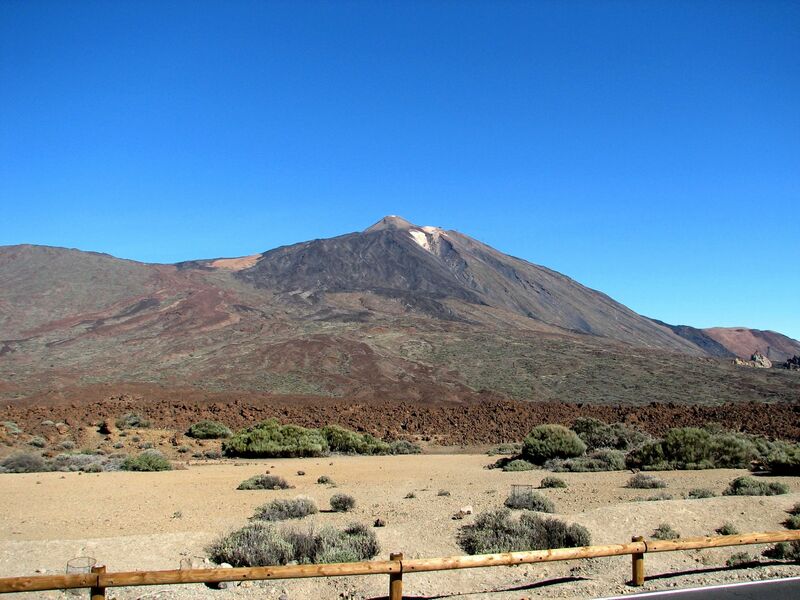 Explore in the comfort of your home to safely “climb” the narrow roads of Tenerife's El Teide National Park. Soon after landing on Tenerife (Canary Islands) we started exploring the hidden and not so hidden treasuries of the island. El Teide, with its peak at 3718 meters above the sea level (>11200 feet) definitely belongs to the latter. This massive volcanic cone proudly piercing high-flying clouds turns out to be the highest mountain not only on Canary Islands but on the whole Spanish soil! Standing at about 7500 meters above the ocean floor (22000 feet) it is considered the word’s third-tallest volcanic structure. “That one is laughing who is laughing the last”. On the left - Cone of the majestic El Teide. Breathtaking views on the northern part of Tenerife from the upper cable station. Incredible forms of lava - "Made by nature"
The ascent through the foothills of El Teide’s massive by car is not an easy task given the narrow roads endlessly turning left and right, with tight bends and quite noticeable traffic of similar to us “car-hikers”. Manual gear does not make it easier (I have to admit that I’m a “rotten-spoiled” automatic guy with the “manual gear” background from the “too remote” past). What makes it worse is the fact that at almost every second bend of the road the breathtaking views instigate temptations – to stop right away and “glue” your eyes in a “secure way” on the opening in front of you scenic view. Somehow the “cold logic” that higher up there views will be even better does not resonate with me. But may be there is a reason for that, because sometimes it is just this moment, this position of the sunlight, and that cloud that makes it spectacular. Well, this is like in an old Hitchcock’s movie scenario which starts with an earthquake and then tensions are continuously raising up. At height of about 2000m (>6000 feet) the vegetation starts to give way to the characteristic moon-like landscape of volcanic lava forms. Vibrant colors of strange lava formations open imagination – actually not only mine, because as I quickly learned some “exotic” movies like “Planet of the Apes” or “Star Wars” were filmed here. Majesty of El Teide from the road. After a good “hour and something” of climbing the road, suddenly in front of us opens a gigantic collapsed caldera – witness to the pre-historical times. The sharp, boundary-like rim ridges we just crossed, like the ancient defensive walls seem to watch over the kingdom of the jealous goddess of fire. From here, the majestic cone of El Teide seems to be at the touch of hand, but we well know that this is just an illusion so typical in the mountains. Fortunately taking advantage of this vast flat area, the new road leads straight as an arrow towards our goal.